A 3-0 defeat sees Monaco second from bottom in Ligue 1. Monaco finished with 10 men and only managed one shot on goal during the game. LYON DOMINATED STRUGGLING Monaco from beginning to end last night to climb back into the Ligue 1 top three and bury Thierry Henry’s side deeper in the relegation zone as they claimed a 3-0 victory. “We have to look at the first goal we conceded and especially the second goal which summed up this game,” Henry said. “Winning without desire is hard. Nabil Fekir added the second in the 34th minute. Kenny Tete shrugged off a timid challenge to pull back a low cross which Fekir attacked while Monaco’s Jemerson hesitated. Monaco managed only one shot all game. They played almost the whole second half with 10 men after Aleksandr Golovin raked his studs down the back of Fekir’s calf in the 47th minute and was sent off. “What a match, I’m really proud of my players,” said Lille coach Christophe Galtier. “We must not forget that we played for more than an hour and 20 minutes with 10 men. Portuguese teenager Rafael Leao headed Lille into a fourth-minute lead, but Galtier’s men suffered a setback when former Southampton centre-back Jose Fonte was sent off in the 16th minute. Jonathan Bamba’s deflected effort doubled the advantage shortly before the interval, though, and Pepe appeared to have made the points safe midway through the second half with his 12th goal of the campaign. “After the PSG strikers, Pepe and Bamba are the best,” said Nimes coach Bernard Blaquart. 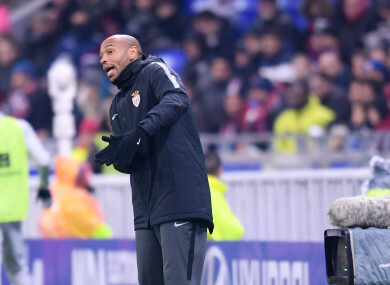 Email “'Winning without desire is hard' - Henry's Monaco plunged deeper into crisis by impressive Lyon”. Feedback on “'Winning without desire is hard' - Henry's Monaco plunged deeper into crisis by impressive Lyon”.